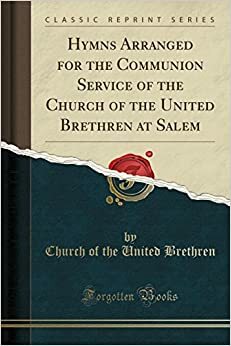 Excerpt from Hymns Arranged for the Communion Service of the Church of the United Brethren at SalemChrist by whom alone we live Bread that came to us from heaven, My poor soul can never thrive, Unless thou appease its craving; Lord, I hunger only after thee, Feed thou me.About the PublisherForgotten Books publishes hundreds of thousands of rare and classic books. Find more at www.forgottenbooks.comThis book is a reproduction of an important historical work. Forgotten Books uses state-of-the-art technology to digitally reconstruct the work, preserving the original format whilst repairing imperfections present in the aged copy. In rare cases, an imperfection in the original, such as a blemish or missing page, may be replicated in our edition. We do, however, repair the vast majority of imperfections successfully; any imperfections that remain are intentionally left to preserve the state of such historical works.